I love boxed sets and have been a part of a dozen sets, excluding my own two, during the past 3½ years. But over the past 12 months or so, I’ve been somewhat relieved when the sets have come to an end. You’re probably wondering why, so I’ll fill you in. About a year ago, Amazon clamped down on being able to publish solo ebooks for books that are in a boxed set and in Kindle Unlimited—unless of course you are the publisher of the set and have a book in the set, then you’re permitted to release your solo ebook. The only way a solo can be released while still in a set and KU, is a print version. I’ve no idea whether this was a new rule they came up with, or an existing one that they suddenly enforced, but the result was that a LOT of authors were sent scurrying to unpublish their solo ebooks. The more recent box sets I’ve been in, we’ve set a 3-6 month maximum lifespan. A far cry from the second boxed set I was in which successfully hung around for 18 months before the authors agreed it was time to unpublish it. Subsequently, the authors of Somewhere Beyond the Blue said farewell to this little over-sixties boxed set at the beginning of the year. With a solo book only allowed in print, it becomes rather invisible on the Amazon rankings, because not that many people order print. So I was really glad when I could release the solo of A Time to Push Daisies earlier in January. I just loved writing this romance between 64-year-old Caleb Blume, and 65-year-old JoAnn Stanson (and if these names or surnames sound familiar, that’s because Caleb is the uncle of the Blume sisters from my Seven Suitors for Seven Sisters series and JoAnn is in A Time to Laugh and A Time to Love, books 1 and 2 of my Under the Sun—Seasons of Change series*). I mean, what’s not romantic about a cruise? It was also so wonderful visiting several places I had been to when we lived in Ireland and holidayed in the UK and Scotland as Caleb and JoAnn became holiday companions when they cruised around the British Isles. Come Monday, I get to experience another thing they did—a cruise! (albeit about a third of the length their time at sea was.) Now normally I love writing about places I’ve been to, but sometimes the actually visiting, or doing, comes after the fact. This is one of those times. Hubby and I are going on a short vacation with my son, his wife, and my two grandsons (aged 8½ and 5). We leave Durban harbor (South Africa) on Monday afternoon and will have four nights and three days at sea as we sail up the eastern coast of neighboring Mozambique, stopping at a Portuguese island and another stop higher up at beautiful Pomene. I couldn’t find any public domain images for Pomene, but do yourself a favor and Google Pomene, Mozambique. It looks stunning. The last time I was at sea was on a ferry—once when we took a 17-hour trip from Ireland to France (and back), and another fast ferry (about an hour) from Ireland to Wales. That long ferry trip was fun (sometimes n-o-t), albeit really cold with teeny-tiny cabins. I also did lunch on a container ship once with the captain and his crew many decades ago with a colleague when I was working for Pilkington Glass in exports. But, a cruise ship…well, that’s just a whole new ball game to anything I’ve been on. Really, they’re floating five-star hotels. The yellow circle near the front, near the top (just below the deck with black windows) is our cabin and my son’s cabin is diagonally opposite us on the inside because if you travel with children, no balcony cabins are permitted. Everyone will just have to enjoy the view from our room, I guess. If you want a sneak peek of what we’re in for, here’s a wonderful tour of the MSC Musica. And speaking of sneak peeks, here’s one of A Time to Push Daisies. Oh, and I promise a blog and photos on this next month. JoAnn and Caleb, oh how you have calmed my heart as I often wondered if something were to happen to my soulmate of 27 years, if I could find love again, if I would even want to. It is so scary thinking about this. Would finding love again even be okay? Would I be betraying my soulmate? Through your story, Marion, so touchingly, JoAnn and Caleb have given me hope that it is okay, that God can bring you love twice. The story of JoAnn and Caleb, setting sail on the Azure Seas cruising London, Dublin, Belfast and much more for two weeks, discovering each other, lost loves, no love at all, and finding out a secret that can tear two people apart. Their journey is one of hope, redemption, sacrifice and finding love when you least expect it. Can JoAnn and Caleb come to terms with how God had orchestrated their chance meeting? Or will that painful secret shatter their hearts? Join me in reading this story that will keep you in tears on every page! I hope you all get to read this wonderful story. I’ll be giving away an ecopy of A Time to Push Daisies to one person who comments. * While A Time to Push Daisies is a stand alone story, and can be enjoyed as such, it is advisable to read books 1 and 2 in the series first. Hi Marion, I always find it interesting learning about the intricacies of publishing. Who would have guessed Amazon had so many rules?! I guess, their aim is to make money for Amazon!! Enjoy your cruise and time with family. Pomene does look beautiful. So glad you got to see a photo of Pomene. I hope it lives up to the images online. 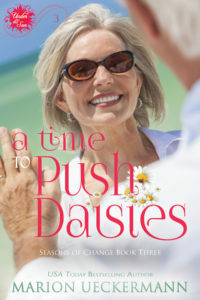 I absolutely loved A Time to Push Daisies, it is an amazing look at love and romance at a mature age! Hope you have a wonderful cruise, cannot wait to hear about it!! I loved writing it, Paula. Caleb and JoAnn were wonderful characters to work with. LOL, praying hard the cruise is on time. At the moment our ship is stranded off the coast of Cape Town due to the Cape Doctor blowing and it being unsafe to try and dock. It’s been there since Thursday. Should have been on its way back to Durban already where we board on Monday. The cruiseline has said that everything is still on track. Just hope the delay doesn’t have any knock on effects. Well, at least we have insurance. Hi Marion! Life is ever changing, and so is the publishing business. When I retired in 2012 freeing time to read, I meet many a new author through boxed sets. But in the last year, I have been aware of a shift in the publishing process of boxed sets. Thanks for clarifying and explaining what is occuring. I enjoy the Blume series and A Time to Push Daisies. Glad Caleb found his happily ever after. After an extremely mild fall and close of the year, we are now facing extreme frigid temperatures. Enjoy the sunshine. Best wishes on your cruise. Enjoy your time your son and his family, especially your adorable grandsons. Make the memories. Totally, Renate. And authors are having to continue relearning strategies to move with the times. We will most certainly enjoy the sunshine, and hopefully the cruise too (see comment response on Paula’s comment above). I too loved “A Time to Push Daisies” in the boxed set (so no need to enter me in the giveaway)! I need to go check if I’ve done a review of the single. I’ve never been on a cruise, so will enjoy hearing more about yours. Thank you, Margaret. And oh, I’d appreciate a review if you haven’t don’t the single :) Glad you loved the story. Excited for the cruise, although our embarkation has been delayed a few hours due to the ship having been stranded the past two days on the southern point of South Africa. God willing, it’ll leave tomorrow and get to our harbor on the east coast some time on Monday :) We are excited. Leave tomorrow morning for the coast … about an 8 hour drive to where we are staying for the weekend. I hope you have a wonderful time with your family on the cruise! I loved A Time To Push Daisies. My soulmate passed away in 2010. We were together 59 years. I didn’t consider falling in love again because I was older. I married a month before my 16th birthday now I’m 84. Life does get lonely, I’m thankful for authors like you that take me away to romantic places and remind me of my sweet husband. I have been on 4 cruisesand they are so much fun. Wishing _ou a fun time with your family. Ah, Virginia. You have made this author’s heart very glad. I’m so happy that our stories take you to happy times with your beloved. My mom and dad died nearly four years ago at the ages of 87 and 88, within 33 days of each other. I guess my daddy just couldn’t live without my mom. I’m so glad they’re together in heaven now and that we’ll see them again one day. WOW, I haven’t realized there are so many rules into Solo compared to Boxed sets on Amazon…. ENJOY YOUR VACATION NO ENTRY PLEASE FOR THE EBOOK! Congratulations, Natalya, on winning A Time to Push Daisies. I’ll sort out gifting that to you asap.